The Davis Bike Club has been involved in randonneuring for decades and is steeped in the history of our sport and its growth in the United States. The DBC was the largest randonneuring club to take riders to Paris Brest Paris in the early 90’s and has been instrumental in supporting the growth of randonneuring nationwide. The DBC Spring Brevet Series is designed to prepare riders for successively longer distance events. Our brevets are for cyclists experienced in riding 100+ mile events and those looking for longer distance challenges, perhaps even joining the ranks of those who have completed Paris-Brest-Paris or other “grand randonnées” of 1200km or longer. Paris Brest Paris is running the third week in August and that means that now is the time to start working towards the “Great Dance”. Close to 7000 of your closest rando-pal’s from around the world will be making the trek to Brest and back. It is an amazing experience and if you have the interest to be at the start of PBP, then we’ll do whatever we can to help you get there. We will be hosting a few meeting specifically designed to help get you ready for PBP. Stay tuned. Every four years, the DBC hosts the 1200km Gold Rush Randonnée…and 2017 was the year! We had riders from around the world, many who succumbed to the heat, but other’s who persevered. Gold Rush is on tap to run again in 2021 and plans are already underway. In addition to our Spring Brevet Series, we offer several randonneuring events in the fall and winter seasons. This year is a special one: after a hiatus of many years, Davis will be hosting the ACP Fleche once again. Fleche means “arrow”, so teams of riders come up with a route covering over 200 miles and ride for 24 hours to all meet up at the same location on Easter Morning. In addition, Davis will hold it’s first Trace event, which is slightly easier than the Fleche, but ends at the same time and day so all can share in their adventures over breakfast. 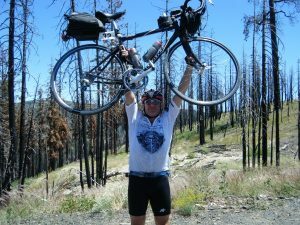 Davis is proud to be a part of the NorCal Brevet Week, which will be a challenging and fantastic week of randonneuring. A series of ACP qualifying rides for PBP will run point to point: San Francisco (300k), Davis (200k), Santa Rosa (400k) and Humboldt (600k); each one bringing you the best of NorCal roads. All of the routes are near a train, bus or airport for you can pick – do one, a few or all of them. Luggage will be forwarded daily. An interest list and more information can be found here. Want to get ready for PBP? This is your week! The 2019 series registration form is here. DBC brevets can be used as qualifiers for 1200km events in the US and around the world. For more information about those rides, and the many brevets being run throughout Northern and Central California, RUSA (Randonneurs USA) has a Rides section that sorts dates, distances, and locations for other brevet series in the region. DBC brevets can also be used toward qualifying for a variety of RUSA awards. For the spring brevet series (200k, 300k, 400k, and 600k), rider control/time stations are 30-65 miles apart and are stocked with basic foods and beverages as part of the entry fee. DBC volunteers are on hand at remote controls, but otherwise, you are expected to be self-sufficient on your bicycle. We expect all riders to be prepared for the weather and for riding on rough roads and environs, and riding in the dark. Please refer to the RUSA rules for more information. Sag support for riders who DNF is minimal at best, so come prepared for all types of terrain and weather and be committed to finish. We look forward to seeing you on one or more of our brevets this season.